While searching for bread articles,i found some useful information about bread itself.Here my post in this lovely Sunday morning,which also my pay day!.I'll be rich in couples hour.Boohoo! Im so happy.Here the fact that i found and i want to share with you all. We start from the earliest race who baked a bread.Did you know the ancient Egyptians are believed to be the first to have baked leavened (raised) bread in about 3,000 BC. 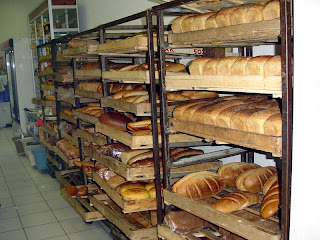 (which i thought the french who first discover about how to do it...)So i wonder how the french get so good at making bread and pastry?How the french discover the same thing that first discover by the Egyptians? So,based on my knowledge in world history which is not much i presumed,i guest they get the knowledge when they explore or when in their conquest on Africa continent.We all agreed that create something new doesnt make anything good if the creation doesnt be something better or well known.Improving and mastering some knowledge is better than create it or invent it.As well researching and publishing it will make it more useful. Farmers receive approximately 5 cents (or less) from each loaf of bread sold.Again,the starters wont get much for their effort.They grew the wheat in hot sun rises,doing the hard work and yet,they got less from it.This is where adding some element in something basic could improve it value itself.As a baker,i'm maybe the tenth person who add the new element on that basic wheat.Here some hierarchy that i think close enough to describe what i mean. Farmer do the wheat planting and harvest. The wheat collect by agent to bring the wheat to factory for proccessing. In the factory,maybe up to 10 or 20 individual handling it into flour process. Then after the wheat tranform into flour,again it collect by agent to distribute. Now,at the hand of grocer it supplies to consumer. And here where i'm standing,in the bakery kitchen process the flour into something so called dough and design the the shape to become something interesting to look and ofcourse delicious to eat. As you can see,the baker is almost the last person who add the new element to the wheat and transform it into something that we can actually eat.Now letme calculate how much i earn for each bread compare to the one who actually "create" it. I made almost 400 pcs of bread everyday with different design and method by myself. True! its alot. $65/400 pcs of bread = $0.16 for each bread i made. Look how much i get by adding new element on that wheat.It almost 3 times from the farmers.Although i do it in air conditioning room and no heat of sun. (but have heat from the oven of course). nice post--now, if you can discover who placed all the carbs and calories in bread--we will be set! Thank you so much for the idea my friend.Now i just started to learn how to write a good articles.Plus my digital camera up by next week,ill be able to make a good post in this site.Every idea and comment were absolutely appriciated.Thanks guy! I enjoyed reading your story. It reminded me that when I was a child my mother used to send me to the store with 9 cents to buy a loaf of store bought bread.